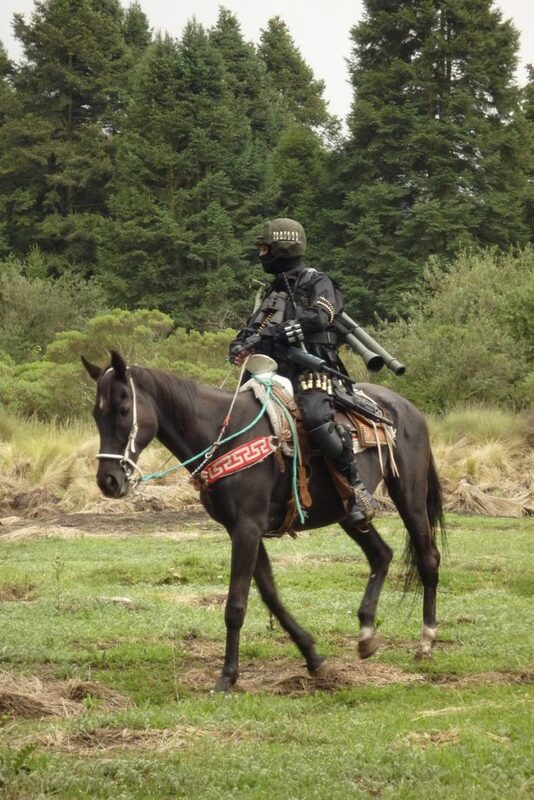 A masked rider who is armed heavily with high-tech equipment sits on the back of a horse, which is harnessed with a traditional Mexican outfit and apparently dances to folkloristic sounds. The interplay between horse and rider seems to occasionally follow a careful choreography and then appears to be totally uncoordinated. Maestra, the name of the Mexican horse means “master” or teacher (the female form) and one wonders who is the one in control in this combination of horse and rider. The video MAESTRA was created from previously unpublished material that was shot in conjunction with the production of HECHO EN MEXICO (2009), which deals with the narco culture of the country and the ongoing militarisation.